Everall Fox, M.A., an enrolled member of the A’aninin or Gros Ventre from the Fort Belknap Reservation, is Coordinator of Indian Education for All for the Billings Public Schools. 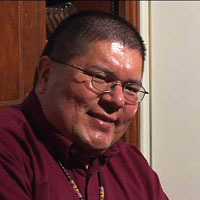 Prior to taking this position, he was the Academic Dean at Little Big Horn College. Mr. Fox shares his perspective on the history of federal policies from the treaty period of the mid-nineteenth century through the Indian Reorganization Act of the 1930s. 1855 Lame Bull Treaty and the Gros Ventre - Everall Fox. 1934 IRA and Gros Ventre Government - Everall Fox. Boarding School Period - Everall Fox. Federal Policy & Disparate Ethnic Groups - Everall Fox.